Du Fu, well-known poet from Tang Dynasty, wrote this poem to praise the natural scenery on Mount Taishan. It is the best among the all that dedicated to the mountain. Since Mount Taishan has a rich and profound cultural background, it has been the destination of homage and spiritual homeland for Chinese people throughout the history. Mount Taishan conveys all these messages with its magnificence. In China, no other mountain has such close connection with success and failure of different dynasties and the Chinese nation. The mountain is like a historical and cultural work, as well as a cultural and natural history museum. Ancestors believed that Mount Taishan was the mountain of the mountains and the sacred mountain between heaven and earth. It was born at around 2.5 billion years ago. The mountain has gradually become the spiritual homeland for the Chinese people. In spite of the change of dynasties, the image of the sacred mountain has not changed among all walks of life. Long history and unique geological location have given the mountain the status of "the center of the world" and "connecting earth and heaven", and therefore has gradually become a sacred mountain. As early as 400,000 to 500,000 years ago, human being started to live in the area near Mount Taishan. Wisdom teeth of local people unearthed south of the mountain prove that human being existed in this area at a very early time. Haidai culture zone near the mountain was named by archeologists, who also discovered Houli culture dating back to 8,500 years ago, Beixin culture 7,000 years ago, Dawenkou culture 6,000 years ago, Longshan culture 4,000 years ago and Yueshi culture 3,000 years ago. These ancient culture heritages were all originated from Mount Taishan culture. The formation of the local culture also benefited from the consistent offering of sacrifice by emperors, poems left by men of letters and diligent works of local ordinary people. As a result, Mount Taishan and the city of Tai'an complement with each other, and jointly form the culture of Mount Taishan. It can be said that Mount Taishan showcases the Chinese history and culture, and represents the Chinese national spirit. Throughout history, emperors, nobles, scholars, literati and ordinary men all regard it honor to pay homage to Mount Taishan. At the meantime, they left their footprints, which helped the mountain better represent the Chinese history and culture. Since China adopted the reform and opening-up policy and developed its economy, the mountain has been introduced to the outside world in a faster speed. 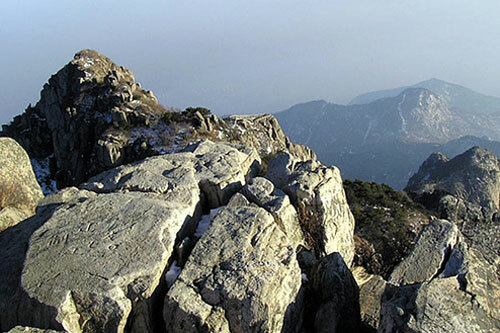 In 1982, Mount Taishan was listed among the first batch of the state-level scenic zone. In 1987, it was named one of the natural and cultural heritage sites by the UNESCO. In 1990, it was awarded Top Sanitary State Scenic Zone. In 1992, it entered Top 40 Best Resorts in China by the State Tourism Bureau. In 1993, the mountain tied knots with Mont-Saint-Michel as sister mountains. In 1997, Mount Taishan was named State Demonstration Scenic Zone. In 1998, it became sister mountain of the Alps. In 2000, Mount Taishan joined the Millennium celebration program, representing China. In 2001, it was awarded as the first AAAA class scenic zone in the country. In 2002, it led the Top Ten Chinese Famous Mountains. In 2005, the mountain was again awarded one of the Top Ten Most Satisfactory Scenic Zones in China, and competed with other places for the title of the Most Beautiful Place in China, as the best in Shandong Province, and it was also listed among the National Geological Park.